Time for another adventure without subtitles; this time the Puneeth Rajkumar starrer Rana Vikrama that released earlier this year in India and showed this weekend in Melbourne. Written and directed by Pavan Wadeyar, it’s an action movie that follows a fairly predictable path but is kept moving along by the Power Star’s charismatic presence and some good action sequences. Throw in some better than average songs, a dash of comedy, and Rana Vikrama is a more entertaining watch than the opening scenes would suggest. The story starts with a rather over the top British Officer in the last days of the British Raj. As expected, the Viceroy (Vikram Singh) is obnoxious, controlling, vindictive and just plain evil, although since Vikram Singh overacts and has been inexplicably dubbed by someone with an East European accent he ends up more comical than villainous. Unfortunately he’s not the only victim of the poor dubbing as a number of later scenes supposedly set in London feature reporters and lackeys also badly dubbed into grammatically incorrect and oddly accented English. Skipping over these technical issues, Vikram Singh chews the scenery for a while and eventually attempts to kill upstart villager Vikrama (Puneeth Rajkumar). Naturally he is no match for the tough local who wins the day despite being beaten, weighed down by chains and shot. Twice. Take note Hollywood – that’s how hard it is to kill a real hero! 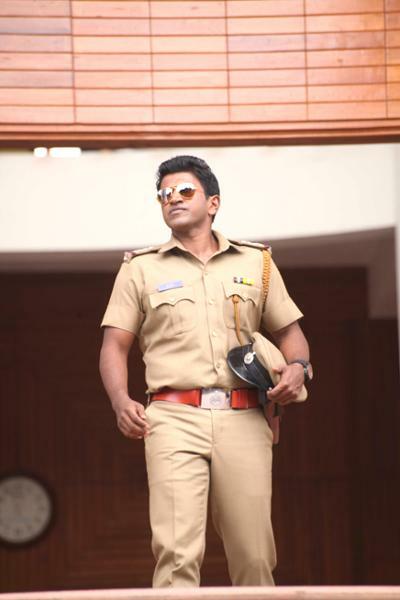 The film then flashes forward to the present day where Vikram (Puneeth Singh again) is an aspiring police officer. Despite his obvious physical fitness, he is rejected by the enrolment officer time and time again however Vikram is determined to succeed, somewhat against the wishes of his fiancée Paaru (Adah Sharma) who would prefer him to stay with her. Vikram is thrown a lifeline by the Home Minister (Girish Karnad) who appoints him as a police trainee and sends him off to investigate a missing reporter somewhere in the border between Karnataka and Maharashtra. 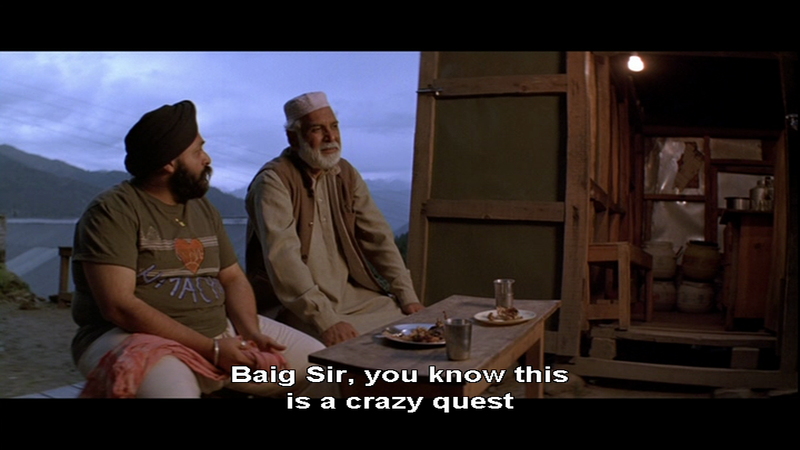 After a few hiccups Vikram finds the spot where workers in chains are toiling away in what appears to be an open cast mine, and makes short shrift of the numerous thugs and villains overseeing the project in classic filmi hero ishstyle. The village has been keep secret for many years due to the nefarious dealings of none other than the British Viceroy’s descendant and the richest man in Britain, Jonathan (Vikram Singh again). He’s just as prone to overacting as his grandfather but with less reason, since he’s supposed to be a successful if rather unscrupulous businessman. However once Jonathan discovers that his secret has been discovered he jets in to India and prepares to get rid of Vikram once and for all. Before we can get to the ultimate showdown however, there is a flashback sequence which explains the opening scene and also exactly why Jonathan’s family wants the land. Vikrama is married to Gowri (Anjali) for this sequence and the couple share good chemistry making this a better pairing than Puneeth Rajkumar and Adah Sharma in the present day. Anjali also gets to swing a sword and her feisty nature fits well into the storyline making her a more memorable and likeable character. I love this song featuring Gowri and Vikrama, which has the added benefit of a gigantic drum as a stage for Vikram’s dance moves. There is always something very special about oversized musical instruments in a dance number! Generally the songs from V. Harikrishna are catchy and the choreography and picturisations are effective with some excellent costumes and imaginative settings. The songs also fit well into the narrative, something which is often more hit and miss in an action film, but they do work well here. If only such attention to detail had carried over into the dubbing and present day Anjali’s make-up to turn her into Vikram’s grandmother. This basically doesn’t work, and casting an older actress instead would have been a better option given that Gowri has little to do in these sequences other than look old and frail (which she doesn’t) and point dramatically at significant moments in the story. There is also a heavy reliance on clips of TV news reports which dulls the impact of some of the more dramatic scenes, although overall S. Vaidhy’s cinematography is impressive. Although the film doesn’t cover any new ground and the heroic antics are far-fetched and fairly improbable, Rana Vikrama is still fun to watch. 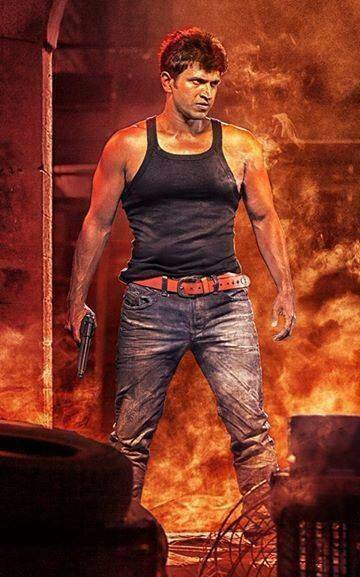 The action sequences from Ravi Verma are well thought out and the Power Star perfectly fits the role of a rough and tough police officer. It’s Puneeth Rajkumar’s film all the way and he does an excellent job of holding the story together despite the caricature of a villain and the rather OTT final sequence. I would have liked a little more care with some of the more technical aspects, but it’s still an entertaining film and one definitely worth catching on the big screen if you can. Dor is one of those rare gems in Indian cinema – a film with strong female characters and an engaging story that keeps you hooked right to the end. There are excellent performances from all the cast and the visuals are stunning with beautiful shots of Himachal Pradesh and Rajasthan. It’s a story that contains many aspects of love and friendship, but it also shines a light on the life of women in rural India and the harsh realities of losing the protection of a husband in a patriarchal society. The film tells the story of Zeenat (Gul Panag) and Meera (Ayesha Takia), two completely different women in matters of personality and culture, and how their lives become intertwined. Despite their many differences the two women also have some commonality as they are both recently married and their husbands have left to work in the Middle East. 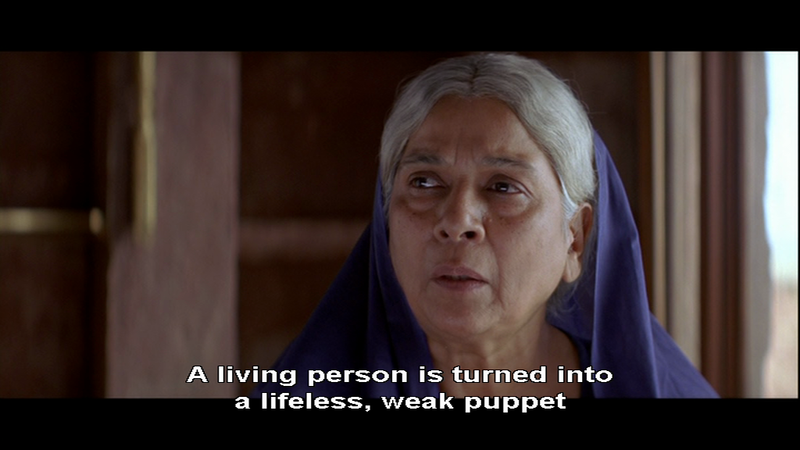 In the opening scenes, director and writer Nagesh Kukunoor uses similar events in the lives of the two women to illustrate differences in their temperament and situation which rather neatly gives the bare bones of the plot, as well as introducing the characters. 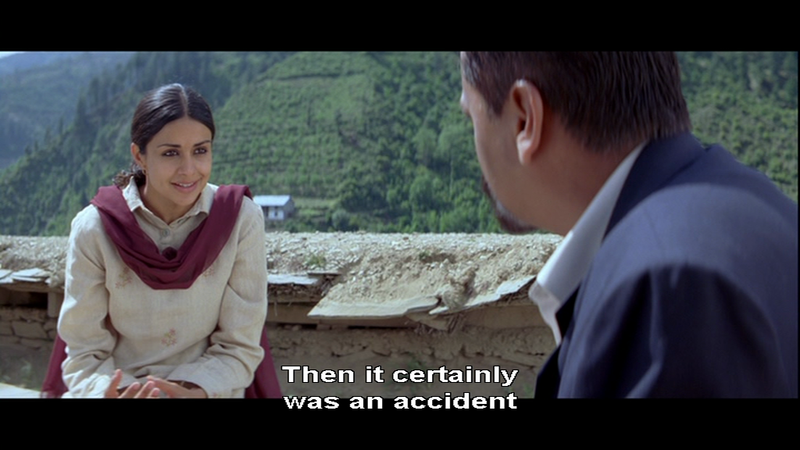 Gul Panag suits the character of Zeenat and perfectly captures her stubborn independence. Zeenat is a Muslim woman from a small town in Himachal Pradesh who is determined to live life on her own terms and maintain her freedom. For example, when her suitor Aamir (Rushad Rana) comes courting Zeenat rejects his advances in favour of repairing her house – personally I would have put him to work! This down-to-earth practicality and lack of sentimentality is repeated throughout the film which has the effect of making the few romantic moments much sweeter as a result of their rarity. Despite her independent nature, Zeenat does love Aamir and when word comes that he has been detained in prison for the suspected crime of killing his room-mate, she immediately springs to his defence. Zeenat is convinced that the death must have been an accident and is dismayed to learn that Aamir has been sentenced to death unless she can obtain a pardon from the wife of the dead man. Zeenat has a close relationship with the local Imam and takes his advice on how to track down the young woman who may be the means to Aamir’s freedom. Although she doesn’t know anything about the woman’s whereabouts, Zeenat heads off to Rajasthan with a small bag, a photograph of the two men and a huge amount of determination and optimism. 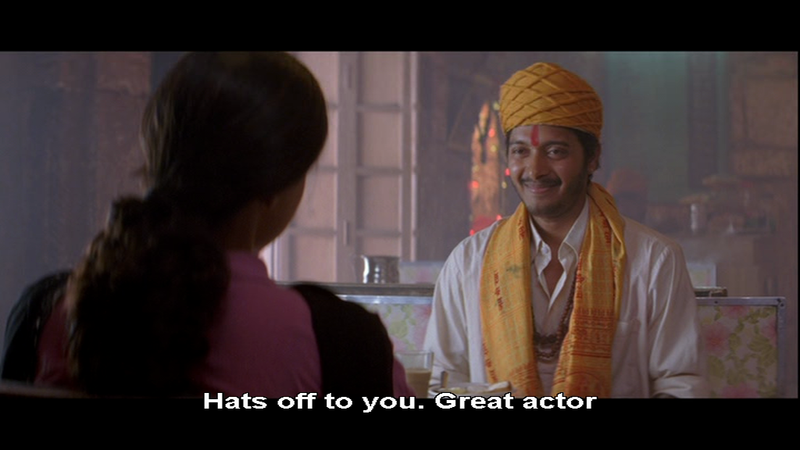 Her faith in the universe seems to be answered when she meets up with a Behroopiya (Shreyas Talpade) despite the fact that at their first meeting he tricks and robs her. However it is the Behroopiya who does manage to lead her in the right direction to find Meera. 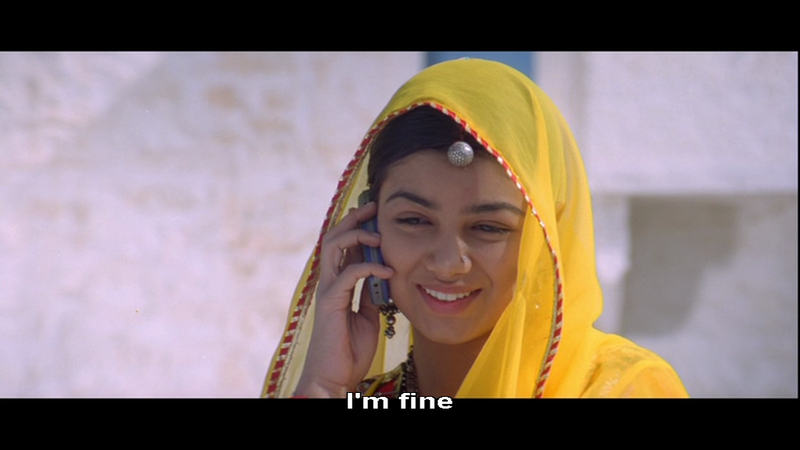 Throughout the opening scenes with Zeenat, we are also introduced to Meena and her very different outlook on life. Meera is happily married to Shankar (Anirudh Jaykar) and has no problems living within the confines of a strictly traditional family in Rajasthan. Ayesha Takia portrays Meena as young and innocent, flirting as she dances joyously for her husband, and becoming upset that he is leaving to work abroad. Her youth is also shown in her pride that it is her husband who is earning the money which will buy back the family’s ancestral home. However as the story progresses and Meena finds out that Shankar has been killed, she exhibits maturity along with strength and resilience as her world crumbles around her. Ayesha Takia is very impressive in a role that demands her character go through a major upheaval in her life and cope with the aftermath. She makes the transition from young wife to virtual living non-entity as a widow very naturally and brings out every emotion as Meera has to deal with her new status in life. Her reaction to the suitcase of her husbands clothes is perfectly nuanced and her moments of joy as she discovers friendship are beautifully acted. It’s not surprising that she won a number of awards for her performance here. 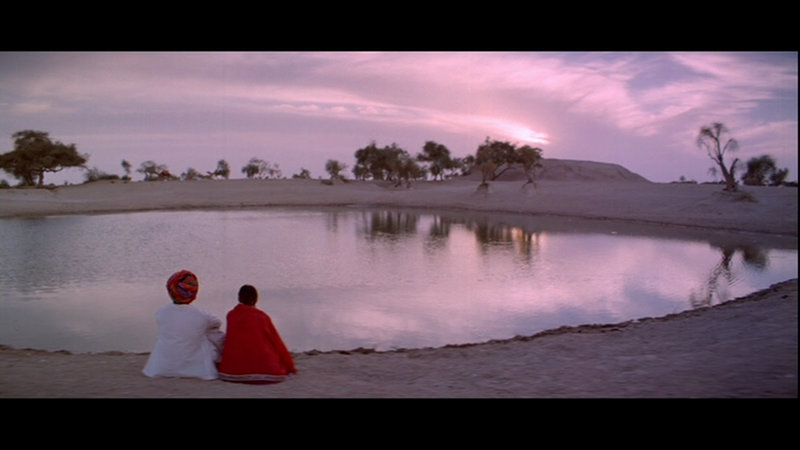 One of my favourite moments is when she dances in the desert with Zeenat and the Behroopiyah – perfect! Although at times the contrasts between the two women seems a little too contrived, for the most part the juxtaposition of their different lives works well. The grief and devastation shown by Meera for the double blows of the death of her husband and her loss of freedom is realistically portrayed while Zeenat’s self-contained grief is tempered with her determination and drive to save her husband at all costs. 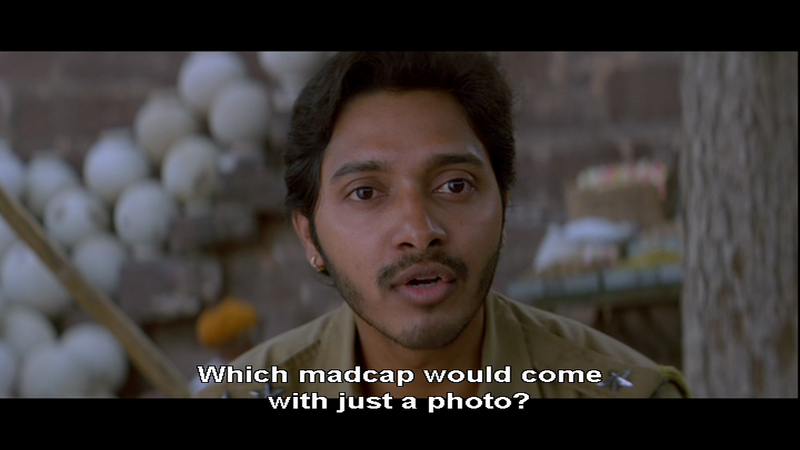 Both actors seem very well suited to their roles, and Shreyas Talpede adds just the right amount of comic relief as the Behroopiya. This character appears to be some kind of a guardian angel or possibly just an embodiment of Zeenat’s subconscious, as he watches over Zeenat and gives her advice. It’s effective, especially when added into the more dream-like landscape of Rajasthan. There is one misstep in the film with the director playing a sleazy businessman who is renting the house in Rajasthan. His repellent suggestion to Meera’s father in law feels filmi and false compared to the rest of the screenplay, although otherwise both Girish Karnad and Prateeksha Lonkar are excellent in the roles of Meera’s in-laws. The background score by Salim – Sulaiman Merchant is beautiful and although there are no song and dance numbers the dancing within the film is spontaneous and just wonderful. This is another excellent song which shows Zeenat’s journey from Himachal Pradesh along with Meera’s symbolic journey from wife to widow. Although not credited, Dor is based on a Malayalam film Perumazhakkalam which perhaps explains the quality of the story. I’m still trying to track down a copy of this original film with English subtitles as it also won numerous awards and I’d like to compare the two. 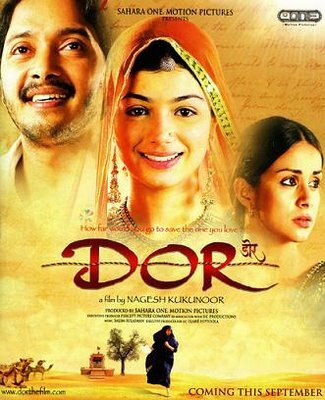 However, Dor is still an enchanting film and the two leads ensure that the quality of the acting is as impressive as the screenplay and Sudeep Chatterjee’s gorgeous cinematography. Although there is an underlying theme relating to the plight of women and their lack of value in some parts of India, it’s counterbalanced by Zeenat’s fierce independence and fighting spirit, so Dor never feels too preachy or morally worthy. it’s a simple tale, beautifully told and I thoroughly recommend it. 4 ½ stars.